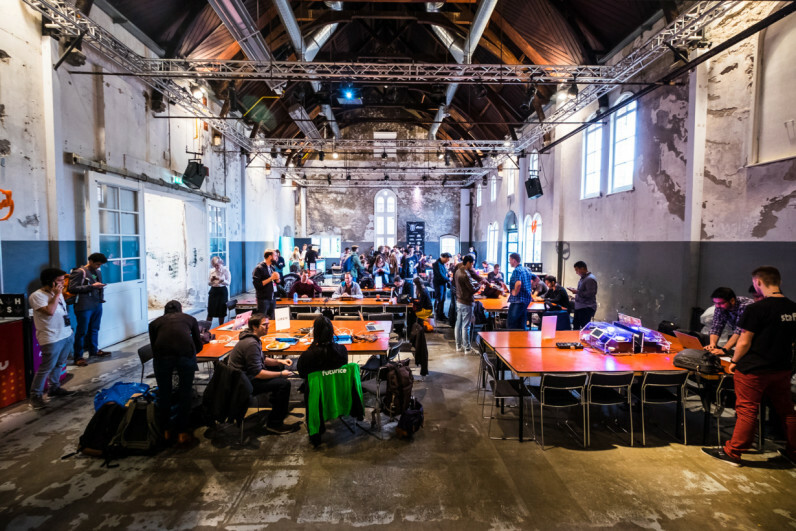 Each year, The Next Web plays host to an epic hack battle. In a mere 36 hours, 140 code lovers, designers, and digital creatives dissected, connected, and created their wildest dreams. The Next Web Hack Battle presents an amazing opportunity for teams to use the Toon and other partner API’s, to enhance the smart home experience and even go beyond into the smart city arena. From smart homes and toilets to emergency situation offline solutions, these were some of the best presentations to date. But with amazing open APIs who joined Toon as partners — including Amazon Web Services, Uber, Deezer, Todoist, YAY images, .ME, CM Telecom, DTL, Joylent, and The Things Network – we expected nothing less. Here are the best presentations from this year’s Hack Battle. ComeEmpty.me, this year’s winner, addresses the issue where your home and your mail box may not be in close proximity. Having a complete user story and building a viable, fully-working app aided in Fokke Zandbergen‘s win. With three simple steps – link device, train it on an empty mailbox, train it for a crowded box – and even those who live in remote villages or don’t have time to check their PO Box daily no longer have to waste precious time and energy on such a menial task. Besides, who knows what’s lurking in your box… that save the date to the wedding of the century or your much awaited tax return check. Using Uber and AWS Lora technology, never worry if your phone is dead or your drunken fingers just can’t seem to find that dang Uber app… Simply pull out your handy, dandy ‘Uber Key’ and this one-press invention immediately hails the nearest Uber. It’s a simple idea, but how many times have you been stranded knowing full well the taxi outside is going to rip you off? While the 3D printed proto-type size is rather comic, the end result will be keychain appropriate. Powered by Toon’s real-time smart home energy data, SmartCasa.me showed the power of a truly smart home. Receive energy consumption alerts to your phone and turn on your lights when you arrive home. Solar panels didn’t charge well on a cloudy day? Decide where to spend your energy and where to restrict its use. SmartCasa give you remote control over your entire home, improved security, and lower energy consumption. While there are plenty of ‘favor apps’, by integrating Uber and Todist tech, this new ‘sharing and caring’ economy app is quite different. Beyond the no limit on distance of task (save for what your wallet allows on Uber charges), PleaseDoThisFor.me is bringing new job opportunities to people who previously didn’t have many. Choose your task, the price (including Uber transportation if applicable), and the location of delivery, then sit back, relax, and let someone else take care of whatever your heart desires. Thanks to Uber integration, even those without appropriate transportation can now find more job opportunities – with the ultimate goal of bringing people who can get things done to the places they’re needed. Smartphone, smart this, smart that – amazing technology with one little problem… they all require internet all the time. So what happens when you don’t have internet access? Through WIT – Without Internet Technology – any API can be accessed through the app which is then transported via SMS. Whether you are traveling abroad, located in a country where internet is spotty, or in an emergency situation, you still have access to the same technology as those online. With countries like North Korea where only 7,000 of its citizens are online, this technology is sorely needed. Whether your brain is scattered or sadly deteriorating from age, one thing everyone has in common is that people look in the mirror throughout the day. From brushing teeth to that last vain look as you walk out the door, Mirror Mirror helps you remember all the important things you need to know. Harnessing the power of Toon’s smart home technology and Todoist’s task management, this smart mirror not only shows your reflection, it also shows you your to do list, weather, grocery needs and, most importantly, medication reminders. With voice activation, you can also search the internet or jot down that brilliant idea you had in the shower. And with facial recognition, the information does turn off when you walk away. Afraid to open that festival bathroom door? Curious to know if you’re about to shake hands with someone who didn’t wash theirs? Via the magic of Deezer and TTN technology, now you can. With one of the most entertaining presentations, Smart WC showed the joys (and not so much) of potty purity. From measuring how much “spillage” someone left on the seat to how long they washed their hands, this is really the Hall of Shame of hygiene. Be careful, it even takes a photo when you enter so you better be on your best bathroom behavior. One of two gaming apps to make the list, Grand Tourist Amsterdam let’s you live out your good versus evil fantasies. Chose your assignment and an Uber is ordered – complete with mood-setting music to really get you into the game – solving puzzles, place to place, and learning a bit about the ‘Venice of the North’. Integrating tech from multiple APIs, one of the coolest features is that the game app actually includes smart home tech, allowing even random houses on the street to participate in the game. Don’t worry though, even the game’s villains can only do as much as turn on a porch light. Still very cool use of tech. How many times have you returned from vacation only to realize you missed out on a landmark you really wanted to see? Or wasted time in queue for something a bit underwhelming? With UberGuide, that will never happen again. This app finds interesting spots along your route. From the super cool to the less than impressive, you’ll know all the interesting facts of attractions nearby. Pressed for time but interested in learning more? Simply click on the landmark to learn fun facts about each place, not only making you more knowledgeable about the city, but also helps you know where to spend more of your time or if the landmark can be scratched off the ‘must see’ list. Share the ride with a friend and challenge them to your very own Uber-version of Cash Cab. Based on your scores as the end of the ride, the loser has to pay. Having had two bikes stolen in Amsterdam this year, this one really intrigued me. Integrating Uber, TTN, and AWS technology – and a little help of Google Maps to triangulate your location – this small device which fits under your bike saddle and notifies you when your bike moves… without you on it. Different from other ‘bike trackers’, this one uses very little power and doesn’t require you to be within a certain proximity. Once notified, simply take an Uber to the new location and retrieve your bike. I suggest taking the current Uber Key version with you as a defense weapon….